Although it is always possible to change colours and textures in existing drawings by updating the swatch in the palette, there may be situations where you want to replace a colour or texture in your drawings with a different colour or texture swatch, without updating the existing swatch. For example, you may want to only replace a colour with a different colour in specific drawings, but not in all the drawings that use the original colour, or you may want to replace a colour with a colour from a different palette without changing your palettes. Using the Recolour Drawing dialog, you can replace all instances of a colour or texture used in your drawings with a different colour or texture swatch. This will actually change the colours or textures from within the drawings, without making any changes to your palette. You can perform this operation on the currently selected drawing, on all drawings in the current layer or in all drawings in your scene. First, make sure one of the palettes in your scene already has a swatch containing the colour or texture you want to replace the original colour with—see About Colour Swatches, About the Edit Gradient and Texture Tool and Adding a Texture Colour Swatch . 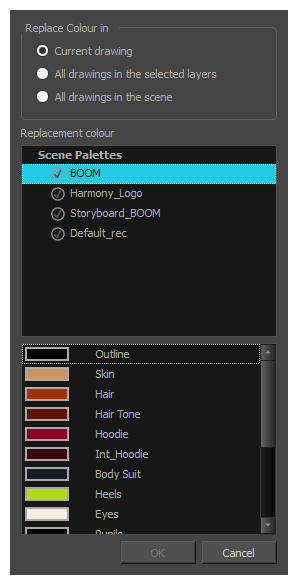 In the Timeline or Xsheet view, select the drawing or drawing layers you wish to recolour. NOTEYou can select multiple layers if needed. NOTEYou can skip this step if you intend to recolour all the drawings in your scene. In the Colour view, click on Show Colour Palettes if you want to replace a colour, gradient or texture, or on Show Pencil Texture Palettes if you want to replace a pencil texture. You can also click on Show All Palettes . The Recolour Drawings dialog appears. In the Replace Colour In panel, select whether you want to replace the selected colour in the Current Drawing, in All drawings in the selected layers or in All drawings in the scene. In the palette list in the Replacement Colour panel, select the palette that contains the colour or texture swatch you want to replace the original colour or texture with. In the swatches list, select the colour or texture swatch you want to replace the original colour or texture with. A dialog displays showing the progress of the recolour operation. When finished, the original colour or texture is replaced with the replacement colour or texture in your drawing.